Offered for sale by Pughs Antiques is this. 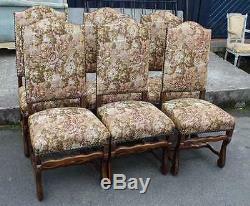 Good Set of 6 Walnut Framed Upholstered Osso Bucco upright Dining Chairs 1920's. Walnut framed with straight high backs upholstered in a floral material. 20"W(51cm) x 21"D(54cm) x 44"H(112cm)- 19"H. (49cm) - to the seat. Some larger items may require 2 persons and therefore be more. For further information please contact Guy at Pughs Antiques >We are based in Leominster, Herefordshire and Viewing is welcomed. The item "Good Set of 6 Walnut Framed Upholstered Osso Bucco upright Dining Chairs 1920's" is in sale since Monday, September 26, 2016. This item is in the category "Antiques\Antique Furniture\Chairs\20th Century". The seller is "pughscorbeille" and is located in Herefordshire. This item can be shipped to United Kingdom.